Despite Bill Nye’s hostility to the Gospel and those who are spreading it, I praise God for the opportunity He gave to AiG to share the Good News with him, and for the world to see how Christians should treat those that oppose them. 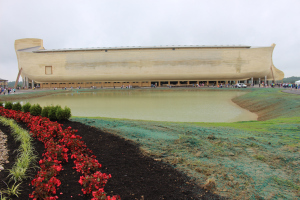 The largest timber-framed structure in the world just received an unlikely visitor as Bill Nye “the Science Guy” made an unscheduled visit to the Ark Encounter in Williamstown, Kentucky on Friday. Visitors were treated to a two-hour impromptu debate as Ken Ham graciously guided Nye on a personal tour through all three decks. The Ark Encounter, which opened to the public on July 7, 2016, is an amazing representation of the historical Noah’s Ark- what it may have looked like, how it could have been built, and how feasible it would have been for Noah and his family to care for all the different kinds of animals that would have boarded during the year-long global flood.